The Agricultural Fund brokers and workers stage a protest in front of the Iranian Parliament on 20 November 2017. Hundreds of protest like this has been organized in Iran in the past two years and have all been precursors of the current unrest. Now, the West as well as the Islamic regime in Iran are surprised by the speed with which the mass protests have spread across dozens of Iranian cities within a few days. They would not have been surprised if they were not caught in wishful thinking for a long time. There were clear signs that the current unrest was going to happen or so to say, the writing has been on the wall for a while. 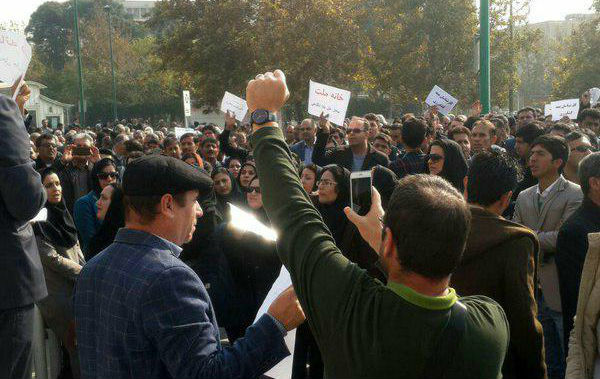 The most recent protests in December 2017 and January 2018 were preceded by years and months of unrest among the Iranian working class and other social strata that were most badly hit by the economic crisis in Iran. It was this crisis that forced the Iranian leadership under Ayatollah Ali Khamanei – and not only the “reformist” president Rouhani – to accept the nuclear deal with the West, hoping that the end of the international sanctions against Iran would boost the country’s economy. Now we know that these hopes ended in disappointment. And the first to feel most of the pressure were those Iranians who bear the bulk of the burden: the poorest. During the first eight-year period of the Islamic reformers sharing power with their conservative companions in the Islamic Republic, namely the presidency of Mohammad Khatami between 1997 and 2005, an alliance of conservatives and hardliners were able to blame the economic hardships on the Khatami government. This lead to the coming of power of Mahmood Ahmadinejad in 2005 and formation of a cabinet of right-wing populist figures claiming to advocate the interests of the poor. Ahmadinejad soon reached international fame for his denial of the Holocaust and his anti-West rhetoric.. What was overshadowed by this rhetoric was the fact that Ahmadinejad executed nothing else than a full-fledged agenda of privatisation in the economy. The only difference compared to the reformer’s agenda was that under Ahmadinejad, neoliberal politics had other beneficiaries, mainly among the Islamic Revolutionary Guard Corps (IRGC) and other institutions which are controlled by the Supreme Leader, Khamenei. The result of the mass privatisation measures implemented by all governments since the early 1990’s has been impoverishment of tens of millions of Iranians. The promise to revive the economy through an agreement with the Western powers did not really persuade the Iranian working class and other social groups who suffered most precariously from neoliberal politics and economy. In 2013, it was dominantly the Iranian middle class who helped the centrist Hassan Rouhani to win the presidential elections, virtually with a single agenda: setting and end to the tensions with the West. The nuclear deal was signed in July 2015, after two years of negotiations. It was enough for Rouhani to be re-elected in 2017, but turned to be no remedy for the disastrous state of the whole Islamic system of ruling in Iran. The economy did not recover to an extent necessary for relieving the deprivations for tens of millions of Iranians. 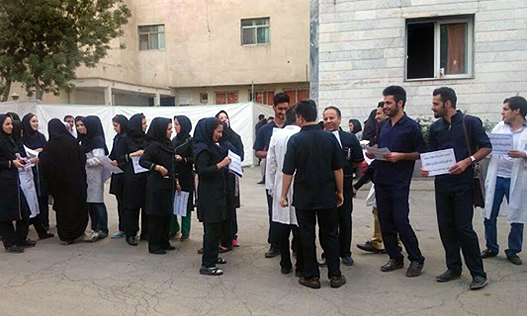 This is the summer of 2015 when Nurses protested inadequate work conditions all across Iran. This photo is from city of Hamedan. One scene in the 2017 presidential campaign in Iran was quite symptomatic for the whole situation in the country: After a deadly mine accident in northern Iran, the president and candidate Rouhani visited the scene and tried to speak to the miners. He was forced to leave when Rouhani’s vehicle and his bodyguards were surrounded by angry workers complaining about the catastrophic conditions under which they have been forced to work in the mine. Rouhani won the elections, but not with the vote of the working class. During the last several years including the months immediately before the outbreak of the mass protests in the last days of 2017, tens of thousands of Iranian workers, nurses, teachers and other wage and salary earners were engaged in hundreds of strikes, demonstrations, sit-ins and other manifestations of protest against the economic hardships imposed on them and their families by the Rouhani’s government. No faction within the regime ever supported or showed even minimal sympathy with the working class protesters. All trade-union activity remained illegal. Dozens of labour activists were arrested, some of them even tortured or killed in prison. 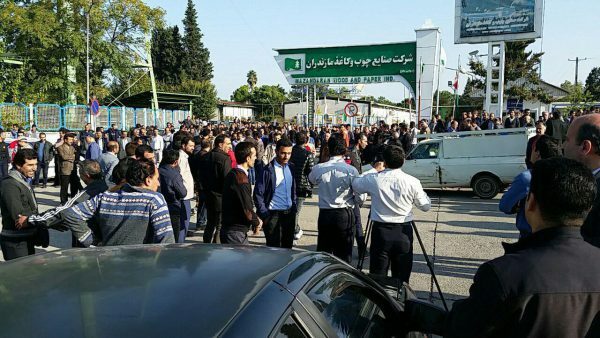 On 22 Oct 2017 the workers of Mazandaran Pulp and Paper Factory stage a protest for past due wages. In 2017, a new crisis hit the Iranian economy, with even more impact on millions of households. Since decades, many Iranians rely on high interest rates paid by some private financial institutions. In 2017, some of the largest of these private banks collapsed, and the savings of millions vanished. The most badly damaged savers were the poorest. 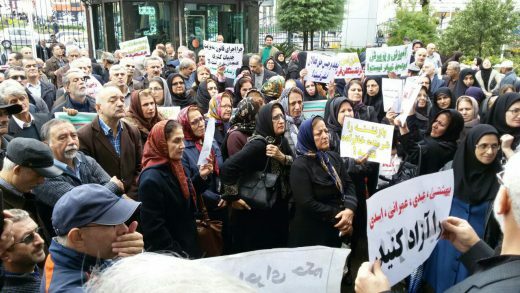 Thousands of them joined demonstrations against the Iranian Central Bank, an organisation responsible by law for the supervision of all financial institutions. The protests were also against the whole government who had failed to prevent the losses from which millions of citizens are suffering. The only response of government representatives to the protesters was blaming them for their “greed” which allegedly had been responsible for preferring private banks because of their higher interest rates. In the ears of women who had sold their last belongings like their wedding jewellery in order to fill part of the gap between wages and the costs of living, the arrogant response of the officials must have sounded like nothing else than a mockery of their pain. In another sign of estrangement between the majority of Iranians and the ruling circles, the son of Mohammad-Reza Aref, leader of the reformist fraction in the Iranian parliament, ascribed his rapidly increasing wealth to his “supreme genes”. His words initiated a wave of outrage among young Iranians who know exactly what the new rich like Aref Junior have profited from, namely their relations with the closed loop of power in the country. Those angry at Aref Junior’s remarksknew exactly that it is not their own “inferior genes” that is to blame for being unemployed, poor and with no prospective in the current economic system of corruption and exploitation in Iran. Probably the last big writing on the wall on the eve of the recent mass protests was the earthquake which shook dozens of towns and villages in Western Iran on November 13, 2017. The government response to that event was a mixture of incompetence, inefficiency and finger pointing between the rival factions, worsended by corruption and theft of goods donated as relief. Thus, many Iranian citizens did not trust the government and tried to organise their own relief efforts. A video clip circulated in social media showed Mohammad-Ali Jafari, the commander of the Islamic Revolutionary Guards Corps, who, during a visit to the earthquake stricken region, pretends to order the delivery of goods in military stocks to relief projects. However, from another angel the film shows the screen of the smartphone held by Jafari and the phone you can see nothing else than a missed incoming call. On 20 Oct 2017 people gather in front of the municipality of Abadan in southern Iran to protests unemployment. Anybody who was willing to read the signs, the writings on the wall showed the degree of alienation between the rulers and the people in Iran. However, the West did not, for obvious reasons. The moderates and reformers who share the power with conservatives and fundamentalists in the Iranian regime since 2013 implemented exactly the agenda demanded by the West anywhere in the world: Privatise the industry and cut wages, subsidies and social spendings. The West was not willing to read the writing on the wall, blinded by the exemplary implementation of a neoliberal agenda, complemented by the images of the smiling Iranian foreign minister shaking hands with his Western counterparts in negotiations about the nuclear issue. Until the end of the Obama Administration, all major Western powers shared the same enthusiasm about the alliance of “moderates” and “reformers” in the Iranian government. As Donald Trump took power in the White House, his administration replaced the enthusiasm shared with other Western powers by a course of confrontation against Tehran. Nevertheless, nobody in the current US Administration seems to have a clear understanding of what has been going on in the Iranian society in the last years and decades. Much of what the US Administration officials have done or said during the first year of Trump’s presidency seemed to be against the Iranians as such, not only the regime. The Iranian regime does not suffer from the travel ban imposed by Trump against citizens of some countries including Iran. The uncertainty Trump has incited about the future of the nuclear deal will be no help to impoverished Iranians either, as the possible recurrence of international economic sanctions helps the Iranian regime to blame economic hardships on foreign adversaries. Many Iranian dissidents and participants in the current protests are urging governments in Washington and Jerusalem to back off from their rhetoric in support of the uprising in Iran. In a video message that went viral in social media, a masked young man requests that Trump and Benjamin Netanyahu, the Israeli Prime Minister, do nothing about Iran and let the Iranians themselves determine their destiny. Many Iranians not only share the anonymous speaker’s attitude against foreign meddling in Iranian matters, but also share his view about what the Iranian youth, the main social basis of the current protests, is fighting against: wide-spread discrimination which is justified by the ruling circles with their alleged “supreme genes”. On 5 Oct 2017 in cities across Iran Teachers protests low wages and inadequate work conditions. This photo is from city of Rasht. It is a matter of fact that Iranians up to the age of 25 are the main driving force behind the youngest protests. According to government officials, most arrested protesters are younger than 25 years. Another fact is that the epicenters of the protests lie in regions most badly hit by the economic crisis. As opposed to the “Green Movement” of 2009/2010, the protests of 2017/2018 did not start in Tehran. They started in Mashhad, an alleged stronghold of religious fundamentalists. When on December 28, thousands of citizens came together in Mashhad to protest against higher prices ofeggs, some “reformers” accused religious fundamentalists under Ayatollah Alamolhoda, the religious representative of the Supreme Leader Ali Khamenei in Mashhad, of having covertly organised the demonstration to weaken the “moderate” president, Hassan Rouhani, and his administration. 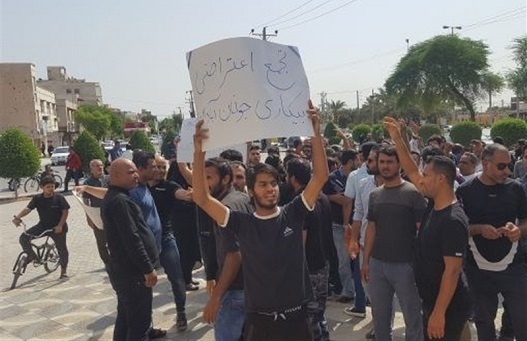 However, in a matter of hours and days, the protests in Mashhad were followed by upheavals in dozens of other cities, mostly small to midsize towns with high rates of unemployment and bad economy. Whatever and whoever contributed to the protests in Mashhad, in the further development of the uprising slogans against the whole system of religious dictatorship prevailed. People across the country chanted “Reformists, fundamentalists, the game is over”, “We do not want an Islamic Republic!”, “Down with the Dictator!” and similar mottos targeting the entire regime of the Islamic Republic. Signs of sympathy with monarchists in the first days of the uprising were not reported from later events. Another obvious phenomenon is the lack of any sympathy with the leaders of the “Green Movement”. From 2009 to 2017, in almost all opposition manifestations within Iran, the participants requested the release of the three leaders of the Green Movement now in house arrest (that is the 2009 presidential candidates MirHossein Moussavi and Mehdi Karoubi as well as Zahra Rahnavard, Moussavi’s wife). Not a single slogan in favour of these three have been chanted since the beginning of the 2017/2018 uprising. Many observers conclude that the “Green Movement” and the current protests are significantly different especially with regard to the social groups that support each of these unrests. While the movement which started eight years earlier in demand for a recount of the votes in the 2009 presidential elections mainly relied on the middle class and had its strongholds in the largest cities like Tehran, currently the middle class seems to be surprised by the militancy and determination of the protesters in the poorer parts of the country and the smaller towns. Another difference between the current and the 2009/2010 protests is that the currently ongoing protests still lack a political leadership. There is no surprise moment in the absence of political organisation of the current upheaval. Since the early 1980’s, the Islamic regime has been consequently suppressing the organised part of the Iranian Left, who would have been the most likely candidate for playing the role of the organiser of the current protests. In the 1980’s, thousands of the members of the organisations of the Iranian Left, from pro-Soviet groups to Maoists, from Trotzkists to Social-Democrats, were arrested, tortured and executed. The culmination of this unprecedented crack-down on the Iranian Left in the Iranian history was the execution of hundreds of Left-wing political prisoners in 1988. Since then, the regime has suffocated any attempt to revive an organised political Left in the country. Socialists and communists are present in Iran, but are not allowed to establish political parties and organisations. The only significant organised part of the labour movement in Iran consists of some independent trade unions. Even these organisations are deprived of a legal status. Many of their members and leaders have been imprisoned during the last years. Some of these arrested activists have died in prison, obviously as a result of torture and mistreatment. The absence of any political organisation of the current protests is their main weakness. Exiled leftist organisations try to overcome this situation, but, far from the main scene of the struggle, their impact is limited. In this situation, the political scene in Iran is not reflecting what is going on under the skin of the country. The regime seems to have definitely lost the support of the poor parts of the Iranian society, or at least that support is rapidly eroding. In the absence of any political power being capable and credible enough to gain the support of the mass basis of the protests, they may undergo phases of standstill. However, many observers share the view that new riots will happen after apparent downtimes. Also, many observers believe that the movement of the poor will finally form its political frame and platform. That may happen sooner or later, but it will happen.